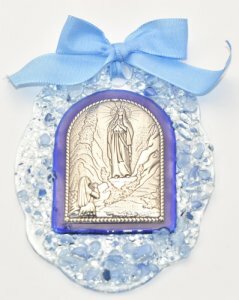 CATHOLIC GIFT SHOP LTD - Murano Glass Keepsake Lourdes Baby Gift. Murano Glass Keepsake Lourdes Baby Gift. Murano glass keepsake baby gift with 925 Silver plated apparition plaque. Comes with a certificate of authenticity of an Italian creation.